My new year’s resolution is to cook something excellent every week. Sometime’s that’s a family favorite like Grammie’s Buns but sometimes it’s a daring new recipe that I’ve never tried before. Today it was scones. 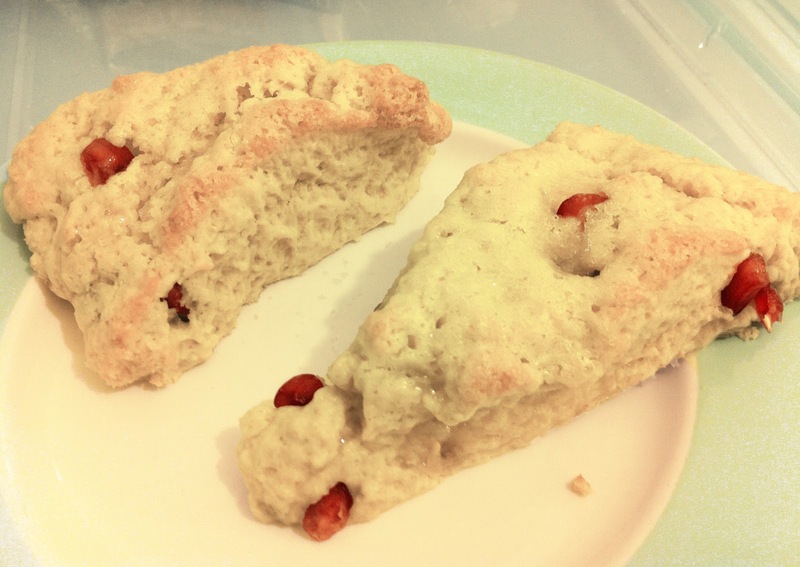 Believe it or not, I’ve never made scones before, and they’re sooo easy! They really WOWed our Parisien friends who’ve never even tasted one before. This recipe is definitely a keeper. Preheat the oven to 425°F (320°C). Use a baking stone or line your baking sheet with parchment paper. In a medium bowl, whisk together the flour, baking powder, sugar, and salt. Add the butter and work it into the flour mixture with a pastry blender until it resembles a coarse meal. Zest the lemon and stir in lemon zest and pomegranate seeds. In a small bowl, beat the egg and the cream together with a fork. Add to the flour mixture and mix with your hands or a wooden spoon until the dough just comes together. Turn the dough out onto a lightly floured work surface. Pat the dough into a round, about 1-inch thick. Cut into equal sized wedges. 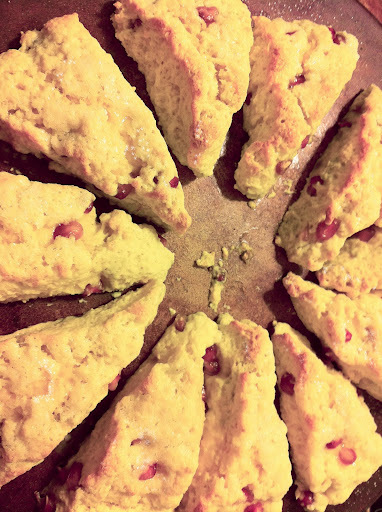 Place the scones on the baking stone. Brush the tops of the scones with cream and sprinkle with sugar. Bake until golden, about 12 to 15 minutes. Serve warm.